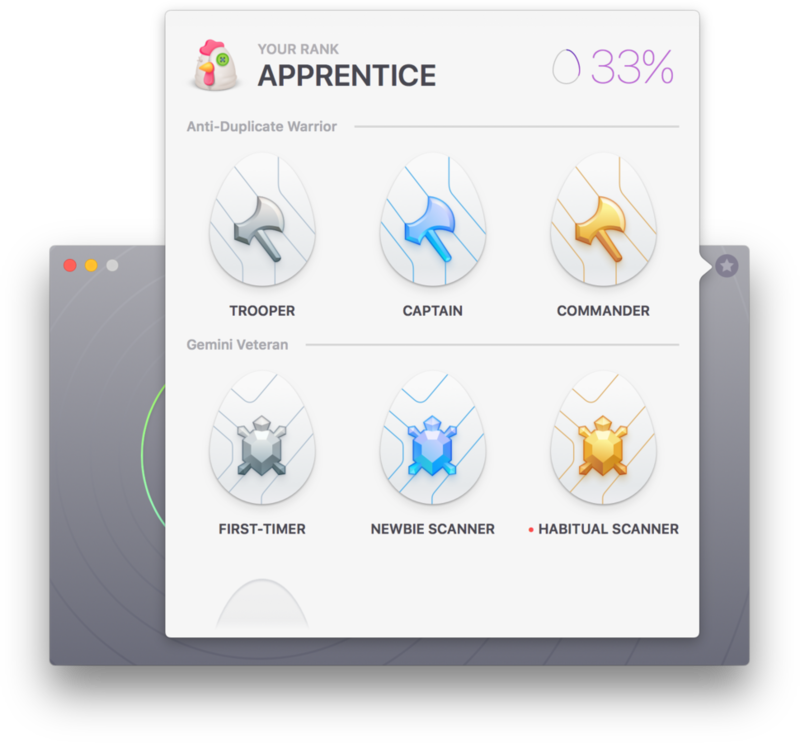 Identifies duplicate folders, pictures, applications, music files, documents, and videos on your Mac and helps free up space by eliminating them safely. If you’ve bought a new Mac in recent years, chances are it arrived with flash storage in place of a traditional hard drive. In terms of reliability and rapid-fire boot times, flash storage is awesome, but it’s expensive. So to make it more affordable, you don’t get the capacity you see with hard drives. There are a lot of ways to work around the built-in limited flash storage, but there’s another method for eking out a little more space: Purging duplicate files. Few of us bother doing it, because weeding out extra copies of photos, documents, and other media simply takes too much time and energy. Gemini 2 offers a minimalist user interface for adding or dropping files and folders you want to examine for duplicates. With Gemini 2 ($20 on the Mac App Store) there’s little reason to fear duplicates. It has a polished, intuitive user interface and the brains to differentiate copies from originals by testing them against nearly a dozen different parameters. It’s also much faster, especially compared to digging through thousands of files and folders the old-fashioned way. The software’s front end is little more than a large plus button where you add or drop folders you want to examine. 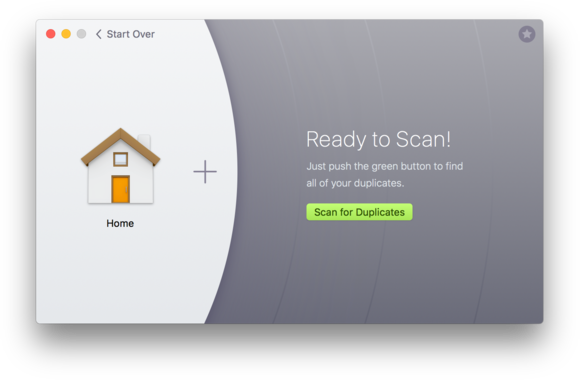 Click the green Scan for Duplicates button, then sit back as the software builds a map of your folder(s) and identifies files believed to be copies, displaying an estimate of how much space can be reclaimed. 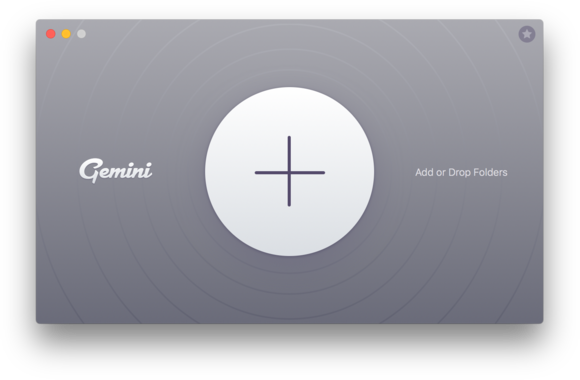 After adding files or folders to Gemini 2, starting a scan requires little more than a click. Assuming duplicates are found, a quick breakdown of the results will be displayed. The garish color graphs from the first version have been replaced by an eye-pleasing circular ring which displays the content type as you hover the mouse around it. Users can then review scan results, which expands the window to display content in a grid or list view, sorted as exact duplicates or similar files. Double-clicking a thumbnail allows users to visually compare files side-by-side with relevant data (size, last modification date, path, and dimensions), which works particularly great with photos and videos. There’s also a search field to further limit results to specific queries. Once your selections have been made, duplicate files can be removed by clicking a button in the bottom right corner. By default, files removed by Gemini 2 are first moved to the system Trash as a safeguard, but this behavior can be modified in Preferences > Removal; files can instead be moved to a specific folder of your choice or permanently deleted with a single click, should you prefer to live dangerously. Following a scan, Gemini 2 displays how much storage space you might be able to free up, along with a breakdown of content type. In most cases, the summary window also offers a second option called Smart Cleanup, which purges anything automatically selected as an exact duplicate by Gemini 2. This option is faster for casual users, but it was also easy to trip up the software by copying and pasting the same PDF files into a folder several times, which incorrectly reported no duplicates found. There are a few occasions where Smart Cleanup isn’t an option—processing entire OS X Photos or iTunes music libraries, for example. In those cases, you’ll want to examine potential duplicates more carefully. However, the software offers yet another safety net, this time moving images or songs to a Gemini Duplicates album for your protection. Gemini 2 users can review scan results using an intuitive window that separates exact duplicates from similar matches. It’s important to clarify the distinction between “potential” and “exact” duplicates. 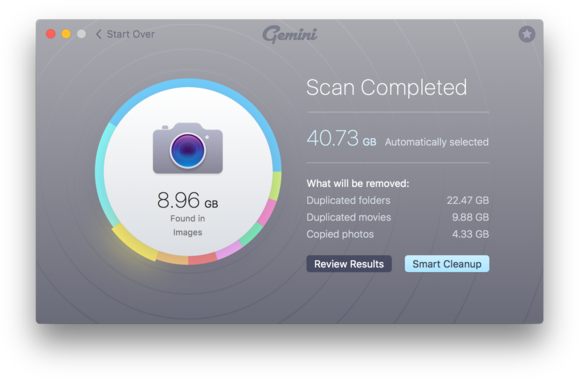 For example, after scanning my entire OS X Photos library, Gemini 2 reported 4.12GB worth of potential duplicates, yet only 102.1MB qualified as exact duplicates worthy of deletion. In my tests, the software was exceptionally accurate detecting exact matches, but potential dupes often include similarly-named music tracks or photos with similar poses and slight framing adjustments you may prefer to keep. Overall, MacPaw has done a great job streamlining and tuning up Gemini 2, but they’ve added a needless diversion in the process. The application now unlocks game-style achievements that allow users to “rank” higher the more it’s used. Users can click the star icon in the upper-right corner to see where they currently stand, or view hints on how to unlock additional achievements. Thankfully, there’s a preference setting to disable such in-app notifications, which I found more distracting than fun. Game-style achievements are more of a distraction than a true new feature in Gemini 2. 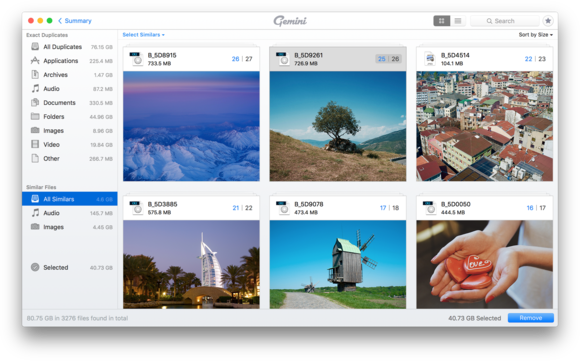 Gemini 2 identifies duplicate folders, pictures, applications, music files, documents, and videos on your Mac and helps free up space by eliminating them safely.